Alain Robert climbing the Burj Khalifa. Despite some difficulties with selling property inside and staying open, the Burj Khalifa is an incredible building. Starting life as the Burj Dubai, it’s the world’s tallest building and an architectural marvel even in the Blade Runner city of Dubai. It’s also the latest tower to be scaled by the world’s greatest climber. 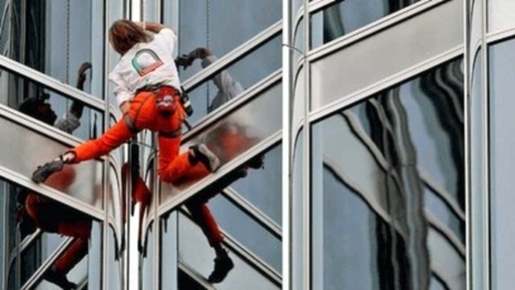 Alain Robert, French Spider-Man, climbed the Burj Khalifa. Robert, age 48, has climbed over 70 skyscrapers, including Chicago’s Willis Tower and Taipei 101, the world’s tallest building before the Burj Khalifa was completed. It took Robert a staggering 6 hours to climb the surface of the Burj; in deference to his Dubai hosts, he wore a harness and wire for protection during his incredible climb. He started in the daytime and ended his climb well into the night, with organizers using spotlights to track his ascent into the record books. An ambulance was standing by (not that it’d do him much good if he fell). For the record, the top of the Burj Khalifa is 2717 feet, according to property owners Emaar Properties. Also for the record, Robert climbed the ENTIRE thing, from the last habitable floor to the giant metal spike that crowns the building’s summit.